How We’re Doing Christmas This Year – Homeschooling in the "D"
Our journey towards a more minimalist lifestyle doesn’t exclude the holidays. We usually celebrate with gifts under the artificial tree, my husband and I looking on as the kids open lots of new toys from us, family, and, of course, Santa. However this year there’s no tree — it stopped working last year so we pitched it. Even if we wanted a tree there’s no space as we’re renovating our basement and all of those things are upstairs. Clearing out the basement gave me the opportunity to evaluate what we want to keep, sell, or giveaway. It also helped me think about how Christmas giving would go this year. Awesome, right? I love how simple this makes gift giving for the holidays and even birthdays. 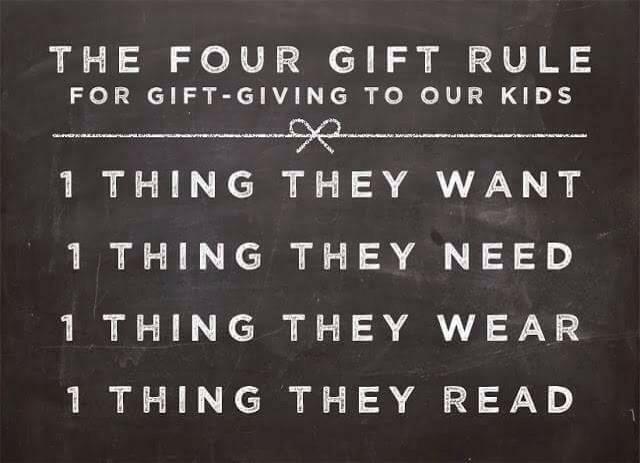 It gives a handful of gifts that are intentional, useful, educational, and wanted. Following this rule, plus purging the old toys, clothes, and books definitely meets our minimalist standards. This also inspired me to start a new tradition of giving the kids a new backpack (each Christmas if needed) that will contain some, if not all, of their gifts. Zero waste gift giving for the win! Since the boys don’t read my blog (yet! ), I’ll spill the beans on what they’re getting this year. They both get Kindles and reading tents. My oldest will get a few books from the Not for Parents series, a Minecraft game for the Xbox One, and undergarments. My youngest will get a dinosaur book, dinosaur figures, and some undergarments. As for gifts from family and friends, I send an email annually giving gift suggestions for the boys. This year I asked for experience-based gifts or gift cards, and gave over 10 options that are free, inexpensive, and local. I used to feel weird about asking for specific gifts, but I’ve found that it makes it easier for family and friends to get exactly what the boys would like. From the list, the boys (and the rest of the family) will receive our zoo, MI Science Center, and Henry Ford/Greenfield Village annual memberships as gifts. Believe me, those alone are some of the best gifts to get! We stay at those places throughout the year. Even though there’s no tree and not tons of gifts, I think this will be one of the most memorable Christmas’ to date.